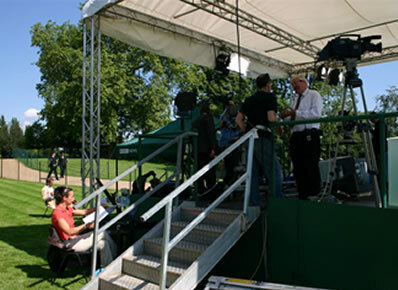 Autocuehire provides a full autocue, teleprompter hire service for Outside Broadcasts and Location Filming. Working on location can be very challenging. There are many things that we have no control over… noise, weather, people, traffic. Sometimes, there is only a small window of opportunity to get the perfect shot… An autocue teleprompter can help make sure you don’t have to worry about getting the words right when it matters. Our standard teleprompters for Outside Broadcast and location filming are portable, compact and robust and can be mounted on regular camera tripods, on a jib, or track. We also provide a separate stand to mount the autocue unit independently off camera, which is useful for interviews. All of our portable autocue teleprompters can be powered by either mains power or 12v batteries, so are ideal for working where there may be no on-site power. Our teleprompters are ultra-bright and readable in sunlight and bright lighting. We also have lightweight prompters for going handheld or mounting on a steadicam or track. An autocue provides valuable support for presenters and speakers of every level of experience. We understand the pressures involved when filming on location, an autocue helps your presenter deliver their message perfectly. Our professional operators are all experienced working on location and know the challenges. They deliver all of the equipment, set it up, input your scripts and make any changes needed, they run the script for your presenter during filming, and then remove all of the autocue equipment off site when finished. We use Autocue software, designed for professional productions. The software runs on the Windows platform and easily imports word documents. You just give us your script and we’ll take care of everything else.